The much-awaited historical film from director Jerrod Tarrog is a lesson on why we should avoid hero worship. Goyo: Ang Batang Heneral, the second part of the historical trilogy by director Jerrold Tarog, has finally opened in theaters. As a follow up to the highly successful and critically acclaimed Heneral Luna, Goyo does not disappoint and here are five reasons why you should watch this epic film. With a budget that has exceeded that of the first installation of the hero trilogy Heneral Luna, Goyo: Ang Batang Heneral outdoes itself with its perfectionist’s attention to detail, from each character’s wardrobe, every weapon used in the battle scenes, and to full-blown sets like a Filipino town with a church and houses as well as a working wooden train. Goyo spared no expense when it came to revisiting the past and bringing the viewers to a time when taking even just one photograph was reserved for more important affairs. With returning Heneral Luna actors like Mon Confiado, Arron Villaflor, Epy Quizon, Alvin Anson, Paulo Avelino, and Art Acuna, even the most mundane scenes in Goyo are made interesting. New additions like Carlo Aquino, Rafa Siguion-Reyna, Gwen Zamora, and Empress Schuck all make their mark here playing an integral part in the last seven months of Goyo’s life. Also worth noting are appearances from Matt Evans, Ethan Salvador, and Bret Jackson in the film. At 24 years old, Gregorio del Pilar was the favorite general of president Emilio Aguinaldo and therefore was loyal to him in all aspects. Unlike other hero movies, and also given the limited archives available on Del Pilar, director Jerrold chose to portray Goyo as a troubled man, who was constantly haunted by inner demons that had his beliefs conflicting with his morals. Goyo: Ang Batang Heneral also serves as the set up for Tarog’s last installment to his hero trilogy with the appearance of a young Manuel Quezon who is played by Benjamin Alves. In an earlier interview, Alves said the movie will show a more unsure side of Quezon during his younger days before he became president. In earlier interviews, director Tarrog said that there was difficulty finding material devoted to or focused solely on the life of Gregorio del Pilar which accounts for the cinematic treatment of some of the scenes in the film. Although Goyo may not have the fairytale ending most viewers are used to these days, it hopes to impart a very important lesson to its viewers, which is to learn to differentiate idols from true leaders. 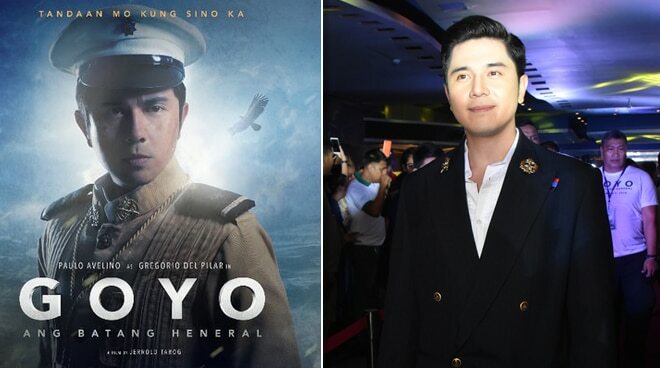 There is no surprise ending in Goyo but Paulo Avelinog’s portrayal brings to life the unsteady emotions of the young general even during his last few moments in battle.